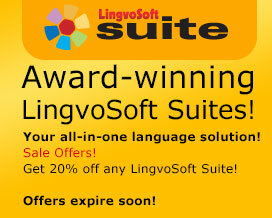 The LingvoSoft Russian Platinum Pack is a superb collection of LingvoSoft software featuring the Russian language. It equips you with advanced applications for all the devices you have now or will have in the future. If you are a student of languages, a businessperson dealing with Russian native speakers, or a frequent traveler to Russian-speaking countries, this comprehensive package will cover your needs in a convenient and cost-efficient way. LingvoSoft Professional Suite English <-> Russian for Windows is the most sophisticated translating and language management solution ever created. Designed to run on your desktop PC or laptop, this versatile collection of essential language tools provides everything you need to get the most out of a foreign language. The perfect all-in-one travel solution, LingvoSoft Travel Suite English <-> Russian for Windows Mobile provides everything needed to make business travel more successful and leisure travel more enjoyable. A unique combination of speech-enabled translating dictionary , a talking travel phrasebook , this resource for Windows Mobile delivers practical information you can count on when visiting another country. LingvoSoft Talking Text Translator for Windows is a speaking translator that provides the highest-quality, most effective and accurate full-text translation of any text or document including business letters, technical documentation, e-mail and much, much more. Employing the latest linguistic developments and syntactic databases, LingvoSoft Talking Text Translator delivers superior text translation instantly. Once translated, the text can then be spoken aloud in English or Russian using the latest TTS (text-to-speech) voice synthesis. This updated translation engine from LingvoSoft even works quickly and effectively on slower running PCs, saving you time and delivering the results when and where you need them – at work, at school, or at home. LingvoSoft Learning Voice PhraseBook English <-> Russian for Windows is a remarkable application that makes learning another language easier than ever before. Part of a revolutionary suite of language learning resources for your PC, it provides you with 14,000 travel-oriented phrases and instantly translates in either direction between English and Russian. Featuring advanced speech recognition and crystal-clear output of native-speaker voice narration it is the most efficient and effective way to improve your command of a second language.